Welcome to our Blog! This is the place where we post our most recent news, pictures, ideas, stories and DIY make-its. 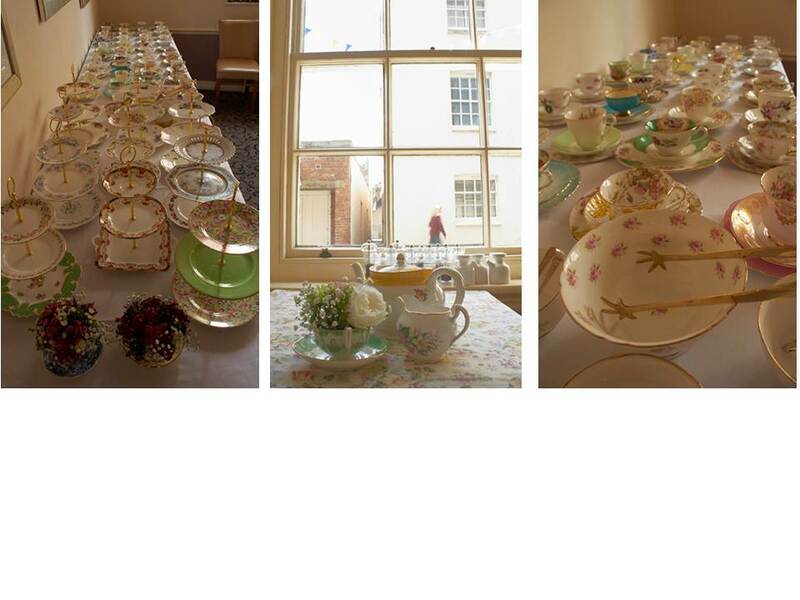 Back in September we were asked to supply some vintage china for the wedding of the lovely Jenny and Russell from Surrey. 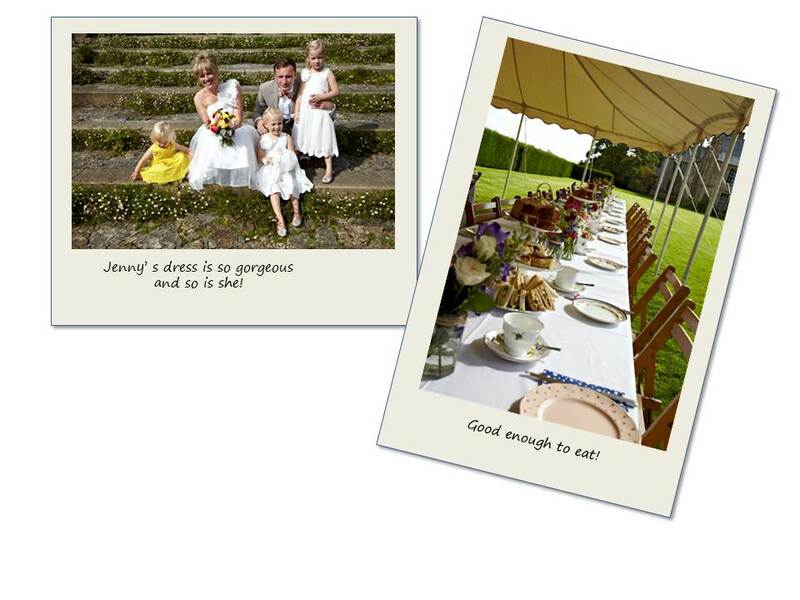 They held their celebration at beautiful Mapperton Gardens in Beaminster, a gorgeous back drop for a wedding with a touch of vintage style! Here’s some pictures of their day to chase away the snowy blues! 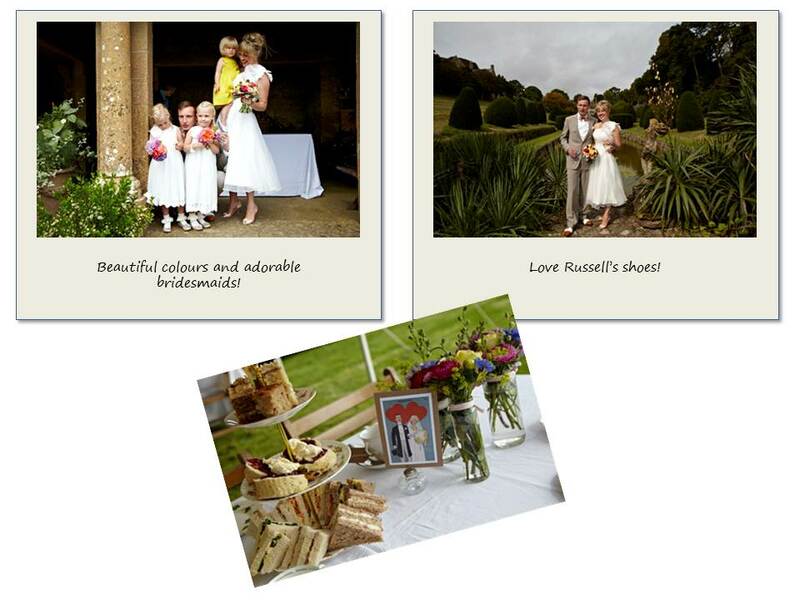 We just love Jenny’s dress, the splash of sunshine yellow in the little bridesmaid dress and those pretty informal table flower arrangements – and Russell does look rather dashing too! Published by annie, on 14th January 2013 at 7:30 pm. 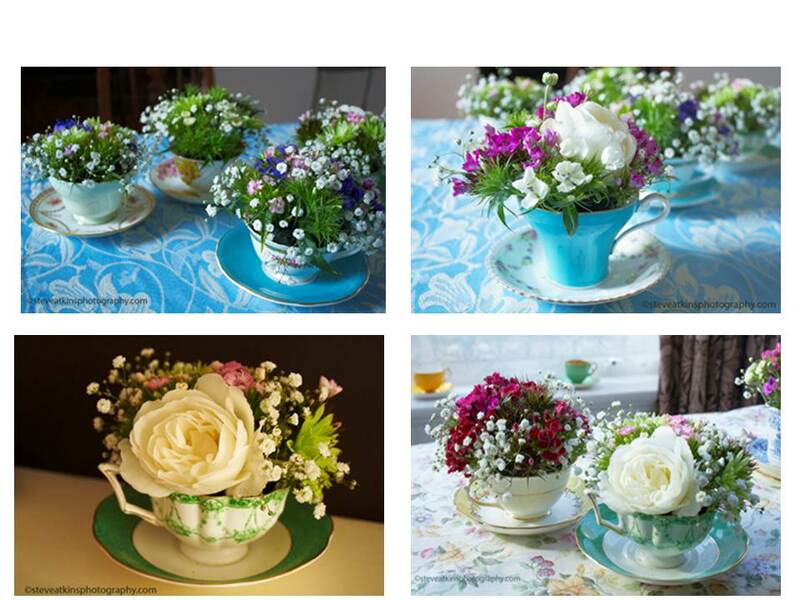 Filled under: Vintage Activities,Vintage Events,Weddings Tags: china hire, crockery hire, Dorset, mapperton gardens, teapot, vintage china, wedding • Comments Off on Gorgeous Mapperton Wedding! Happy New Year everyone! We do hope this year brings you peace and happiness even though we currently seem to be wading through rain and mud at every turn! It can’t last, honestly…….. So to cheer us up we thought we’d share a few more photos from the lovely event we were involved in back in the summer with Julia’s House in Corfe Mullen. 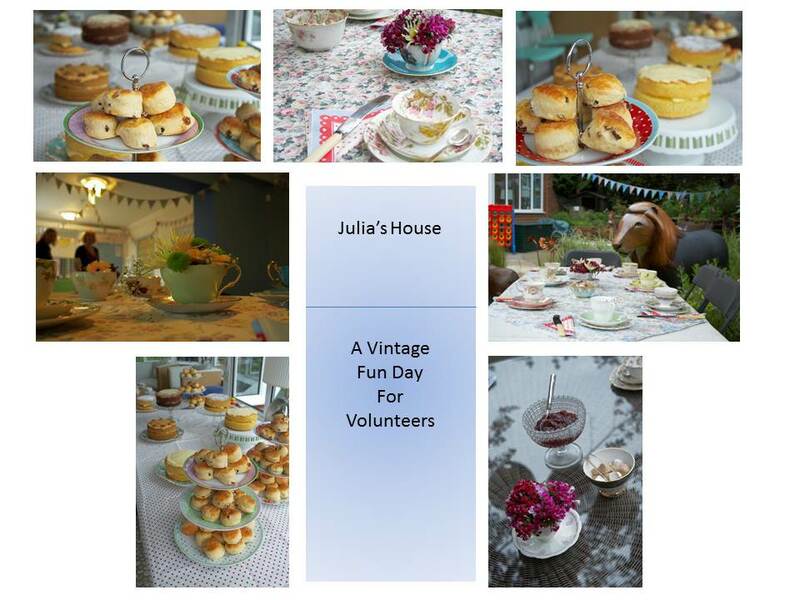 Children’s charity Julia’s House (dedicated to supporting children with life-limiting conditions) wanted to say thank you to their volunteers as part of National Volunteers Week by holding a vintage tea at their hospice at Corfe Mullen. With more than 100 volunteers supporting the charity – taking on work from fundraising to van driving; working in the Julia’s House shops, providing admin work and giving support at the hospice itself – there’s a huge range and potential for volunteering activity that is vital to the charity. The vintage tea was an opportunity for employees from Julia’s House to say thank you – serving tea and scones to volunteers and showing them the facilities and work that takes place at the Corfe Mullen hospice. Follow the link HERE to see what Julia’s House had to say about the day and do enjoy the photos below – we just lurve that lion!!! And he didn’t eat too many cream cakes either! Published by annie, on 2nd January 2013 at 9:52 pm. 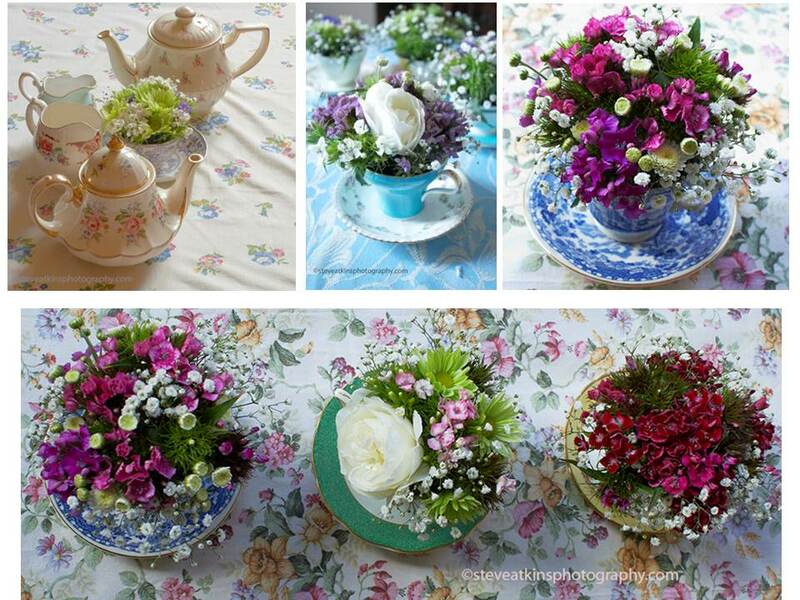 Filled under: Vintage Activities,Vintage Events Tags: bunting, china hire, Dorset, event, Julia' s House, party, tea, tea party, vintage china, vintage crockery • Comments Off on Vintage Fun for Volunteers! For our final blog of 2012 we thought we would share with you one of our favourite Christmas poems “Twas the Night before Christmas” also known as “A Visit from St. Nicholas” by American poet Clement Clarke Moore (1779 – 1863). Apparently, before this poem became so popular, St. Nicholas (of course Santa Claus) had never been associated with a sleigh or reindeers! Can’t really imagine not having Rudolf around at Christmas! Merry Christmas from all at Vintage Dorset! We hope you have a peaceful and joyful day and a great New Year – see you in 2013! 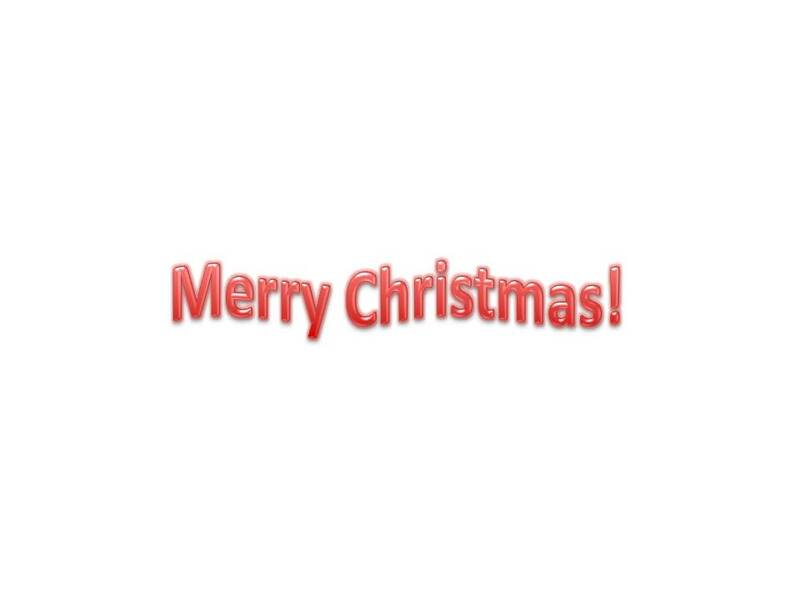 Published by annie, on 23rd December 2012 at 12:52 pm. 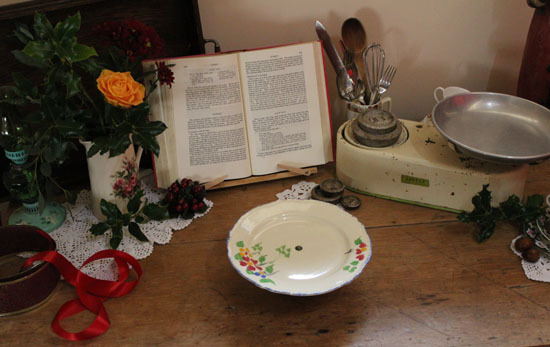 Filled under: Christmas,Vintage Activities,Vintage Arts,Vintage Events,Vintage Local History Tags: Christmas, Christmas poem, tradition, vintage china hire, Vintage Christmas, Vintage Dorset • Comments Off on The Night Before Christmas! 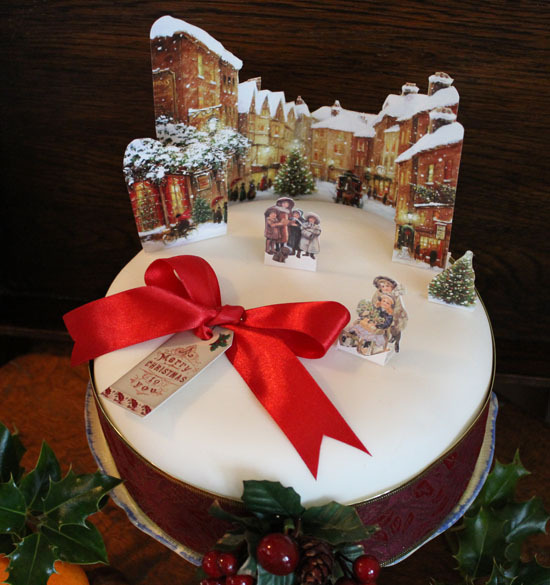 It’s one of our favourite times of the year….when we get to decorate the Christmas cake! 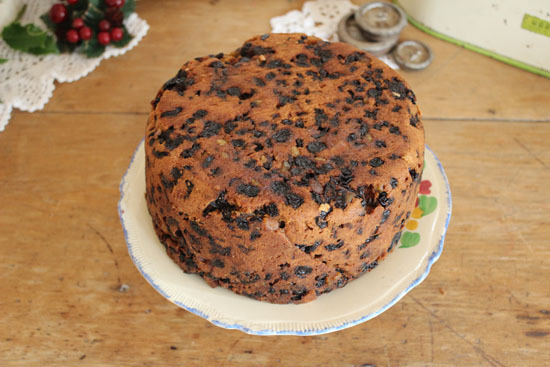 Our cake (made from a very old family recipe going back three generations) has been resting happily under the bed all wrapped up in parchment for the last few months, only coming out every now and again for a feed of brandy, sometimes whiskey and occasionally rum (and to be honest any alcoholic spirit we can find……eeek it’s going to be more like a Christmas cake cocktail!) and now it’s time to decorate it – before the fumes knock us out. 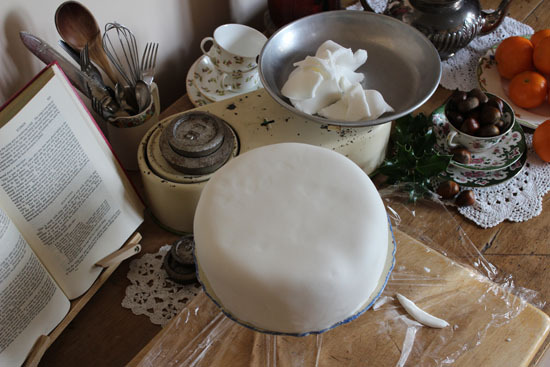 We thought we’d share the process with you – we are no Nigella’s here at Vintage Dorset so bear with us, we like things simple and uncomplicated and we’re not looking for perfection! So to begin – most importantly we always have a small glass of something gorgeous on the side to help the decorating process go smoothly (this year a lovely Pedro Ximenez sherry) and put the fab old Christmas tunes CD on to really get in the festive spirit, then we can get started. 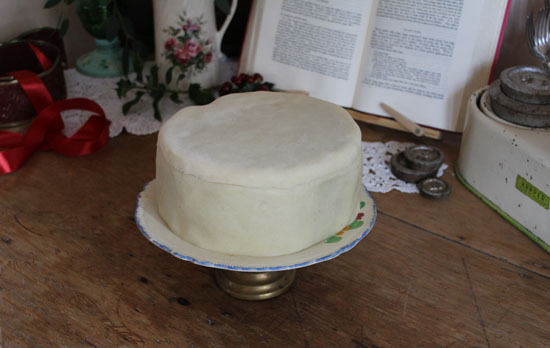 We’ve chosen a lovely old single tier cake stand for our cake this year. And here’s the monster itself in all its naked glory! We’ve turned it upside down to give a nice flat (ish) decorating surface. 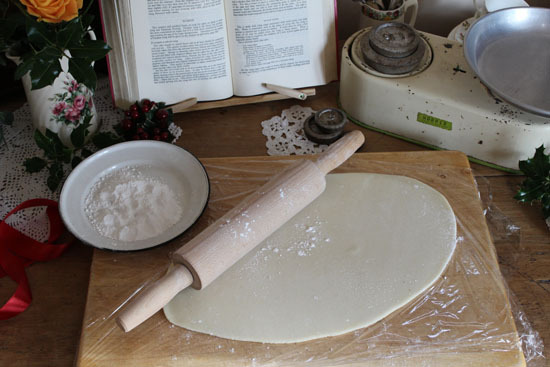 We used clingfilm on the board when we rolled out the marzipan as it’s so much easier and you don’t end up with a sticky mess to clear up. We’ve gone for white marzipan as we like icing to be fairly thin and we don’t want the yellow marzipan showing through. You can use brandy marzipan but we thought there was already enough booze going on! 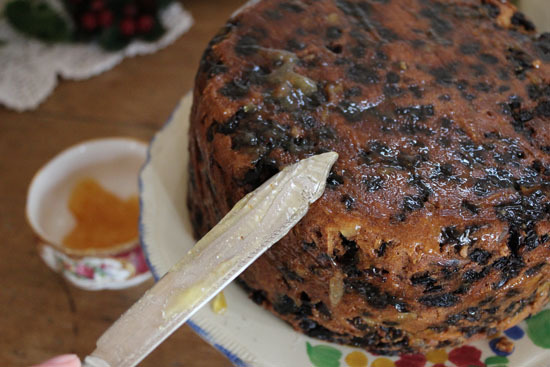 We spread apricot jam over the cake before applying the marzipan – or you could use marmalade but not the lumpy kind – not conducive to a nice flat surface! Here’s the marzipaned effort and then the iced cake. We used fondant icing – mainly for ease but Royal icing is fine – and definitely better if you want a good old fashioned snow scene. Ok so our iced cake may be a bit wonky but as we said – we’re not after perfection here – and by now we’ve had a glass or two of sherry! And so to the decorating! 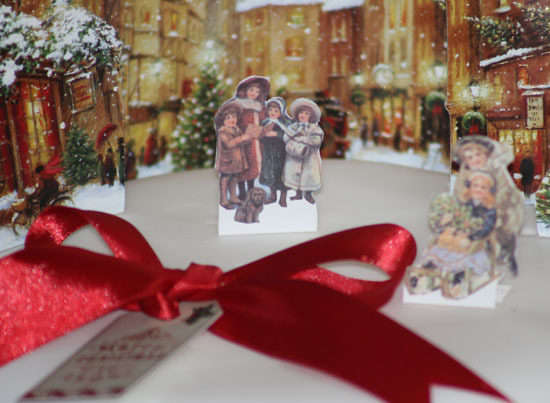 We found some lovely reproduction vintage Christmas cards and cut out the scenes we liked to make a 3D effect. Just make sure you allow some card below the picture to make a little stand. We used sterilised pins to pin the cutouts to the cake but you could use a bit of icing instead. Then we added a lovely ribbon with a cutout label (again from a Christmas card) and finished off with a little vintage inspired wreath at the front with another ribbon round the cake (mainly to disguise the lumps and bumps!). Very simple but very pretty. Here’s the finished article – we like it, hope you do too! Published by annie, on 16th December 2012 at 1:22 pm. 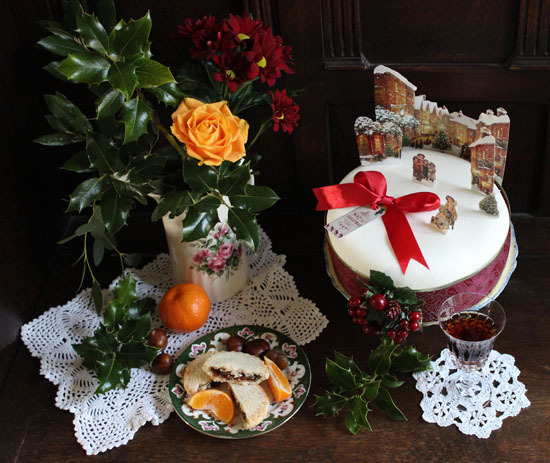 Filled under: Christmas,Vintage Activities,Vintage Events,Vintage Food Tags: cakes, celebrations, Christmas cake, food, vintage china, Vintage Dorset, vintage tea • Comments Off on Fun with Christmas Cake!